When Republicans return to the reform issue, which senators will they need to woo? 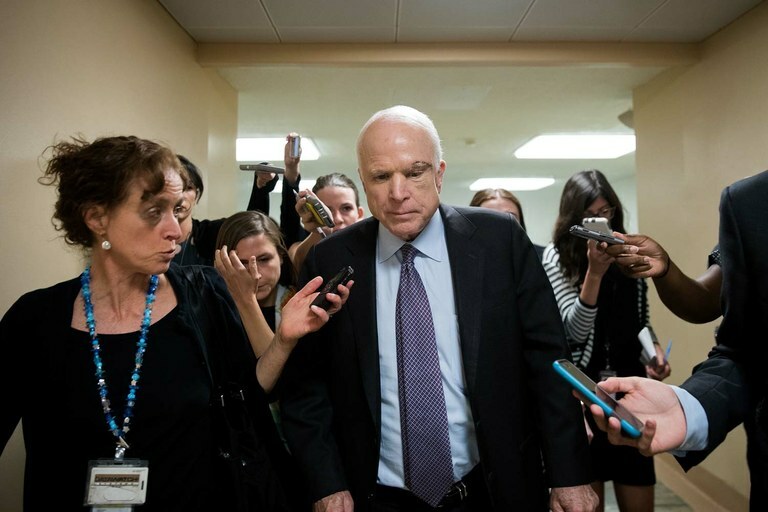 Last week, Sen. John McCain, R-Ariz., announced that he could not “in good conscience” vote for the latest version of legislation to repeal the Affordable Care Act. He cited the lack of a bipartisan effort on the bill and hard data that show how many people would be impacted by the proposal. This bill, known as the Graham-Cassidy proposal, is the latest effort by the GOP to overhaul the ACA, often called Obamacare. Just after undergoing surgery for a brain tumor in July, McCain stunned members of his party when he voted against a previous iteration — the “skinny repeal.” Sens. Bill Cassidy, R-La., and Lindsey Graham, R-S.C., swiftly revised this legislation with the latest changes leaking to the media Sunday night. This bill, too, is now poised to fail. But as Republicans make last-minute changes to the health care bill — racing to bring the bill to a vote before the fiscal year ends on Sept. 30, after which it would need 60 votes to pass instead of 50 — two Western senators remain at the center of the controversial repeal effort. Alongside Kentucky and Maine, recent changes to the bill give more money to Arizona and Alaska, home states of McCain and Sen. Lisa Murkowski, R, in a clear effort to garner their support. Sen. John McCain talks to reporters on his way to an amendment vote on the GOP heath care legislation in July. McCain is among a handful of Republican senators who have come out against or expressed concern about the Graham-Cassidy bill, fomenting doubt over its ability to pass. Recent revisions include a 15 percent increase in funding for Arizona (not enough, evidently, to secure McCain’s vote). In an attempt to sway Murkowski, the revised bill also includes funding increases for Alaska. Murkowski, who voted against previous ACA repeal efforts, has said she needs to see more data before she decides how to vote on this bill. One of Graham-Cassidy’s provisions would give significant funds to the least densely populated states, including Alaska. And in a key gesture, the bill would allow Native Alaskans to maintain eligibility for Medicaid expansion if they’re enrolled before 2020. Another provision would give additional Medicaid matching funds to Alaska and other states with high poverty levels. Critics have pointed out that Graham and Cassidy’s estimates for state-by-state funding don’t factor in cuts to regular Medicaid, noting that if they did, the estimates would show a net loss in federal funding for Alaska. The Graham-Cassidy bill would dismantle the Affordable Care Act’s marketplace, instead giving funds to states via block grants, which states could use to create their own programs. The proposal achieves this in part by slicing away funding from states that expanded Medicaid. Like the earlier “skinny repeal,” it also includes deep cuts to regular Medicaid financing, which many Westerners depend upon. In a preliminary report, the Congressional Budget Office estimated millions of Americans would lose health coverage under the Graham-Cassidy bill. With Maine Sen. Susan Collins joining McCain and Kentucky Sen. Rand Paul on the “no” side on Tuesday, Republican lawmakers will yet again have to return to the drawing board.